Barack Obama’s campaign is taking off from where Mitt Romney’s primary opponents left off. Romney’s years at Bain Capital is attacked in the above ad. It is debatable as to whether there was anything improper about Romney’s work at Bain or if this is part of the system. At Bain, Romney’s function was to increase profits, not to create jobs. He served the stock holders, not the public interest. Regardless of one’s view as to what Romney did in private life was proper, the important thing is that Romney’s business experience is not of value in terms of creating jobs, expanding the economy, or governing. 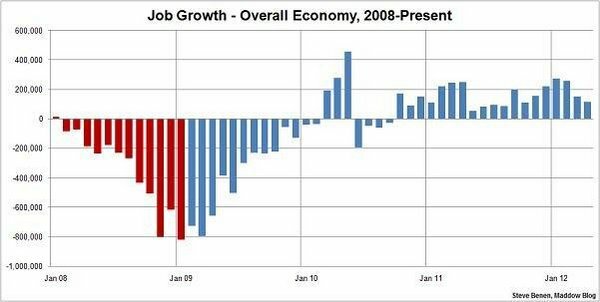 One of Mitt Romney’s many lies on the economy is a false claim that Obama promised to reduce unemployment to under 8 percent with the stimulus. The 8 percent figure was based upon projections by staffers before the final economic statistics were available. Eight percent unemployment was projected when data at the time suggested that the GDP had contracted by 3.8 percent in the previous quarter under George Bush. When the final analysis was done it was found that the GDP had actually contracted by 8.9 percent. In other words, things were far worse because of Bush’s policies than was realized at the time leading to staffers to make more optimistic projections. This was not a promise as is being claimed by Romney. While the projection of unemployment under 8 percent was not applicable to the actual conditions we faced, Obama actually would have met this number if not for actions by the Republicans in Congress. Besides blocking further stimulus money, the Republican cuts in the budget caused the loss of a significant number of public sector jobs. This also carries over to the private sector. For example, if schools cut the use of school buses due to a cut in the budget, there could be loses of jobs by people actually employed by private companies to provide the service. The Labor Department’s establishment survey of employers — the jobs count that it bases its payroll figures on — shows that the government has been steadily shedding workers since the crisis struck, with 586,000 fewer jobs than in December 2008. Friday’s employment report showed the cuts continued in April, with 15,000 government jobs lost. But the survey of households that the unemployment rate is based on suggests the government job cuts have been much, much worse. In April the household survey showed that that there were 442,000 fewer people working in government than in March. The household survey has a much smaller sample size than the establishment survey, and so is prone to volatility, but the magnitude of the drop is striking: It marks the largest decline on both an absolute and a percentage basis on record going back to 1948. Moreover, the household survey has consistently showed bigger drops in government employment than the establishment survey has. 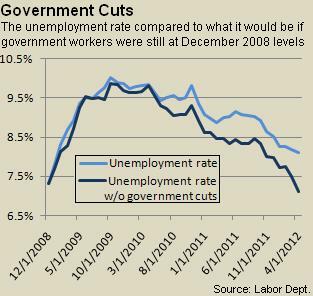 The unemployment rate would be far lower if it hadn’t been for those cuts: If there were as many people working in government as there were in December 2008, the unemployment rate in April would have been 7.1%, not 8.1%.